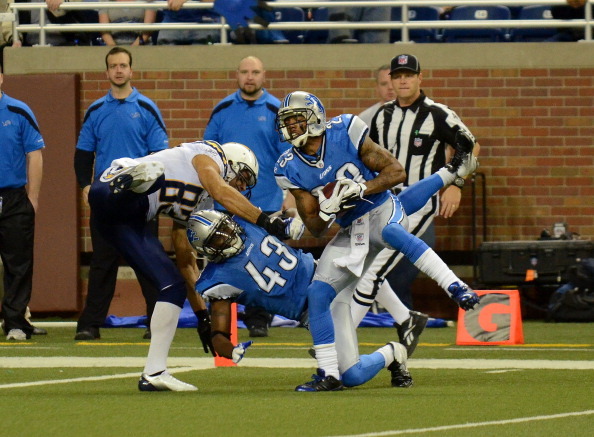 LAST GAME 12/14/11: Chargers 10 at Lions 38. Detroit QB Matthew Stafford throws for 373 yards & 3 TDs (137.6 rating). Lions DE Cliff Avril records INT-TD. LAST GAME AT SITE 12/16/07: Chargers 51, Lions 14. San Diego RBs Darren Sproles & LaDainian Tomlinson combine for 238 rushing yards & 4 TDs. Chargers defense has 5 INTs. BROADCAST FOX (1:05 PM PT): Thom Brennaman, Charles Davis, Tony Siragusa (Field reporter). Westwood One: John Sadak, Mark Malone. SIRIUS: 135 (Det. ), 138 (SD). XM: 231 (SD). LIONS: Won 11 games last year, tied for 2nd most in season in team history…QB MATTHEW STAFFORD passed for 4,257 yards in 2014, his 4th consecutive 4,000-yard season. Has 18,912 pass yards since 2011, 2nd most in NFL…RB JOIQUE BELL led team in 2014 with 860 rush yards & 7 rush TDs. Reached 1,000+ scrimmage yards (1,182) for 2nd consecutive year. RB THEO RIDDICK had 4 rec. TDs in 2014, tied for most by NFC RB…WR CALVIN JOHNSON had 1,077 rec. yards in 2014, his 5th consecutive 1,000-yard season. Since 2011, leads NFL with 6,214 rec. yards & 105.3 rec. yards per game. WR GOLDEN TATE led team last year with career-high 99 catches & 1,331 yards, his 1st 1,000-yard season…Last year, Lions led NFL in rush defense (69.3) & 2nd in total defense (300.9). LB DE ANDRE LEVY had 150 tackles in 2014, 2nd most in NFL. Has 7 INTs since 2013, most by NFL LB. S GLOVER QUIN led NFL in 2014 with career-high 7 INTs. Quin (7) & JAMES IHEDIGBO (4) combined for 11 INTs, most by S duo in NFL last year. DE EZEKIEL ANSAH has 15.5 sacks in 1st 2 seasons…CHARGERS: Since 2006, QB PHILIP RIVERS has won 4 division titles & ranks 2nd in NFL with 36,507 pass yards. Has started 145 consec. games, 2nd-longest active streak among QBs (ELI MANNING, 167). In past 8 vs. NFC, has passed for 2,579 yards (322.4/game) with 20 TDs vs. 8 INTs with 104.9 rating…Rookie RB MELVIN GORDON (No. 15 overall) rushed for 2,587 yards in 2014 for Wisconsin, 2nd-highest season total in NCAA-FBS history (HOFer BARRY SANDERS, 2,628 in 1988)…WR KEENAN ALLEN led team with career-high 77 rec. for 783 yards & 4 TDs in 2014. Has 4 TDs in past 5 vs. NFC. In 7 seasons with Buf. & SF, WR STEVIE JOHNSON posted 336 catches for 4,267 yards & 31 TDs. In last meeting, WR MALCOM FLOYD had 6 catches for 95 yards (15.8 avg.) & TD…In past 4 vs. NFC, DT COREY LIUGET has 2 sacks, 2 FR & FF. S ERIC WEDDLE led team with 104 tackles in 2014. Since 2007, is 1 of 3 in NFL with 19+ INTs (19) & 6+ sacks (6) (CHARLES WOODSON, REGGIE NELSON).